The role of a typical Chief Marketing Officer (CMO) at a technology, media or telecommunications company is very challenging -- especially if they're skilled in the practices from the bygone era of legacy mass-media marketing. Many struggle to adapt to the needs of today's forward-thinking interactive online marketing environment. 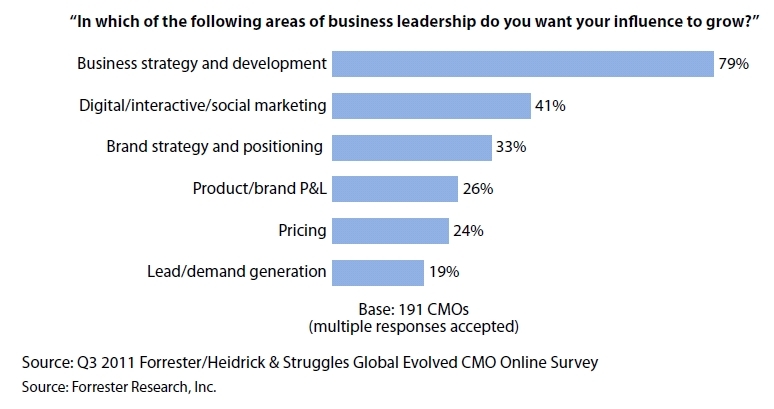 According to the latest global CMO survey by Heidrick & Struggles and Forrester Research, CMOs need to contribute to substantive business strategy, but many need to raise their marketing technology IQ first -- so that they can become more credible as leaders in their organization, and clearly demonstrate that they're not obsolete. Based on a survey of nearly 200 global marketing leaders, the market study attempted to measure CMOs' influence within their organization, their business objectives, and their skills and competencies necessary to survive in a rapidly changing realm of digital marketing. Almost 80 percent of senior marketers said they wanted their influence to grow as business strategy and development leaders. They see improving their relationship with the senior executive team as a critical way to get there, with 38 percent saying C-level relationship building is the skill they most want to improve. But in a world that's now being driven by a technology-empowered customer, the number-one skill to improve on is digital marketing skills. In fact, 40 percent of CMOs say increasing their technology knowledge is their top self-improvement goal -- that's a dramatic increase from the previous survey in 2008. "For CMOs to prove the value of their role and justify the marketing investment, they must clearly illustrate the ROI of marketing plans, influence the understanding of their brand strategy across other functional areas of the company, and engage technology and sales peers to create a consolidated vision of how to succeed with customers," said David M. Cooperstein, Forrester vice president and practice leader. While building meaningful relationships with the senior executive team is seen as an area of improvement, not all relationships are created equal. Despite the rise in importance of technology and digital media, CMOs are still prioritizing relationships with the CEO, CFO the head of sales -- rather than the CIO or CTO. Only 30 percent of senior marketers see this relationship as important to develop, indicating a wide gap between marketing and the two technology-oriented departments. 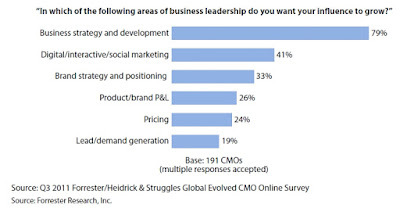 The survey also indicates that CMOs are increasingly recognizing the need to act as company strategy leaders, not just marketing staff managers, by ensuring that marketing becomes the growth engine for the organization -- rather than the primary producer of high-level messaging for press releases and marketing collateral. In fact, 42 percent of CMOs claim that truly representing the "voice of the customer" is now one of the most critical factors in ensuring personal success as a marketer. However, many recognize that they're unable to assume that important role. They're schooled in the legacy marketing monologue, not today's interactive dialogue. "Companies realize that it is very difficult to defend a competitive advantage mainly based on cost efficiency -- they are now moving to customer intimacy to drive differentiation," said John Abele, global managing partner of Heidrick & Struggles. This shift in focus has to become part of the DNA of leading organizations. It will be a journey, and CEOs demand that their CMO be truly capable of leading that important expedition. It requires visionary leadership and an understanding of functional implications that will need to change to fully embrace this approach.